The MTA owns Grand Central, right? Nah, it's this guy. The MTA has a lease that expires in 2274. But—loophole—they have an option to buy GCT this year. But—double loophole—that could be postponed by the landlord to 2032. Agern, owned by Dane Claus Meyer (a founder of Noma) and chef Gunnar Gislason from Iceland, whihc gives GCT sophisticated and exquisite cooking, is momentarily closed due to flooding. You can still get your ScandiFix next door at Great Northern Food Hall. And if you've got a 3-mile morning run in you, join Mr. Meyer this coming Thursday, at 59th and 7th, 7:30am for a jog that ends with coffee and a cinnamon swirl at Great Northern. Whispered sweet nothings never sound better than they do at the Whispering Gallery outside Grand Central's Oyster Bar. 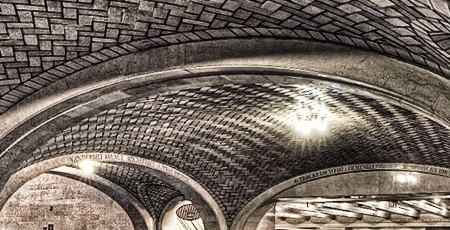 A few years ago, the MTA did reno work on the Guastavino treasures, but the high-fidelity is intact. Talk the the corner. GCT celebrates National Poetry Month with a passel of poets writing poems on request (!). The event takes place in Vanderbilt Hall this Friday, April 7, 11-7. April 7 is also National Beer Day (you might request a poem about beer…). Shop and restaurants around the terminal will be offering various specials. Work on your backhand at the Vanderbilt Tennis Club, upstairs in GCT. Also upstairs, The Williamson Library, a large collection of railroad books, magazines, and memorabilia, maintained by the NY Railroad Enthusiasts, open by appointment. More on the Williamson. French artist Jacques-Émile Blanche wrote of him in 1928: "He was the most talented of all. Manet, Monet, Renoir were all convinced of this, just like we were." Blanche was referring to Paul-César Helleu, for whom history has not shared the same judgment. He's the artist who created the original GCT zodiac ceiling mural (yes, backwards). More on Helleu. One of our favorite artist/illustrators, Matte Stephens, has his own version of that Grand Central mural, with some charming, if questionable, constellations. Bloomberg reports the reopening in May of what was The Campbell Apartment, to be shortened to The Campbell. They also have an especially good 'secrets of GCT' (including a ski slope).